I suppose I tend to write my headlines as though I were writing for a printed publication rather than a blog. In the case of printed publications headlines tend to draw the reader into the story. But on the web I doubt that headlines are all that important. Still I can't resist. How could you mistake a Bald Eagle for an Eastern Phoebe? Well strictly speaking you couldn't. They're just too different. But if you went looking for an Eastern Phoebe in the same location as you found last year's first of year bird and instead you found a Bald Eagle then you might be able to get away with it. And that's what happened to us. Just as were ending a quick trip to Morris Arboretum in search of migrants like Eastern Phoebes a mature Bald Eagle lifted up from down low, either from the pond at the wetlands or from the teeny Papermill Run. It was so sudden and unexpected that I got neither drawing, photo, nor visual memory. But I did want to commemorate it visually. So this is based on a combination of two photos: one of the pond at Morris taken the same day, and one from a low flying mature Bald Eagle seen at Crane Creek in Ohio last September. As a test of the theory that all watercolor, or at least most of it, can be done with just one good quality large brush, this is all done with a size 8. In birder parlance 'F.O.Y.' means 'First of Year.' Though the unseasonably warm weather of the last few days should convince anyone that spring is here, I actually prefer to gain that knowledge by seeing certain natural events that always take place at the same time of year. For instance, the arrival of the first Tree Swallows, who tumble through the air in what looks like boundless enthusiasm. Of course it's probably more simple: they're hawking insects. The first kildeer of the year are the same, and the first blackbirds, chipping loudly and then singing their 'Conk-a-ree' song. These events are what convince me that spring is truly here and that the new cycle of warm seasons has begun. Winter is fading. We saw our first of year Tree Swallows and Red-winged Blackbirds today at Morris Arboretum. We also saw one Kildeer. And we saw many angry geese, constantly squawking and chasing one another, head down like some vicious snake. We'd never really noticed this behavior before but I'm sure it was territorial - one more sign that spring is truly here. 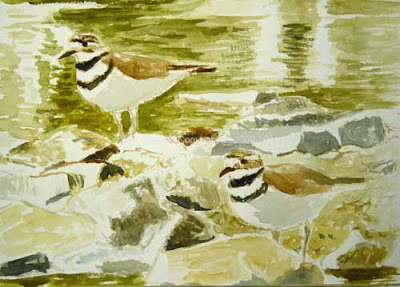 Finally I'm nearing the end on this watercolor based on some photos I took last week of the first Kildeer of the year. I did a quick watercolor last week but I wanted to do something more developed on better paper. That inevitably causes me to lose some spontaneity I think. And I used a lot of gouache to regain lost whites. I'd prefer to get my whites and light colors through better planning and saving the white of the paper. But for now this will have to do. 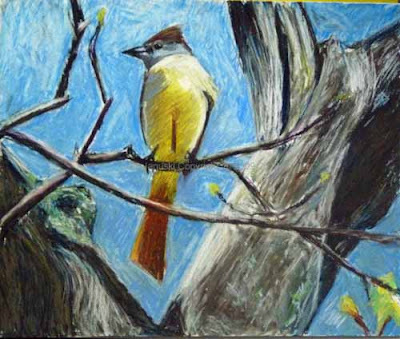 Someone, I think Ellen from The Spicebush Log, once mentioned that drawing and painting birds must be relaxing. It is. But it is also tense. One of the tensions is getting what you want down on paper but still keeping the white of the paper so that there is a sense of light emanating from the paper. It is tense but it's also one of the things that I think makes art addictive to artists. You always try to do a little better, and you always know that what you've done is not perfect. So you may be thrilled with it. And yet over time you see the next plateau on the horizon. Yesterday I got out for a brief hour to see what new birds had arrived in Philadelphia. 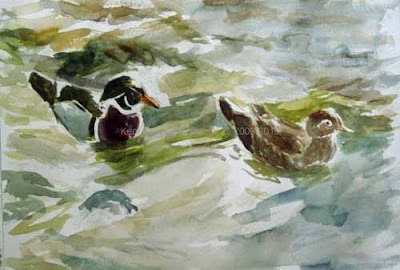 Wood Ducks! Both are incredibly handsome ducks, the male in an extremely showy way, the female in a much more understated way. I did a few quick fieldsketches, and you can see how rusty I am. 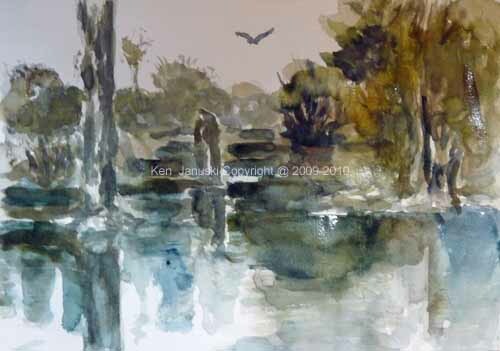 I also took some photos and they are the basis of this watercolor. You might say I'm a bitty rusty here too. But I do like the watercolor. It has some sense of them. There's nothing more exciting that fieldsketching so let's hope this is the beginning of a long and fruitful season. Taxes, errands, chores and rain have all put a damper (no pun intended) on getting any art done since last week. 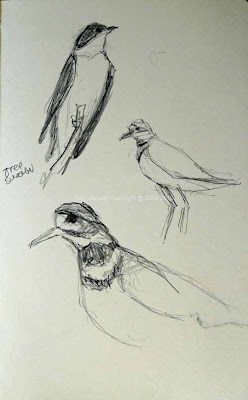 I did do a few sketches of kildeers based on last Sunday's photos but they're really not worth showing. Nature has not stood still while I have though. Our 'Arnold Promise' witch hazel above is in full bloom. We've chosen this part of our side yard to mimic the woodsier areas of both Philadelphia, and Shenandoah National Park, where we spend so much time in spring. So a witch hazel was a natural choice. Perhaps if we'd known more when we bought this we would have gone for the native version rather than this cultivar. Maybe, maybe not. In any case it shows the graceful arching branches that are so attractive in witch hazels. And here of course it also shows its beautiful yellow flowers. We've seen many warblers in witch hazels in our travels but we've yet to see one here. In Shenandoah National Park we saw both Blackburnian and Cerulean warblers in the same tree. 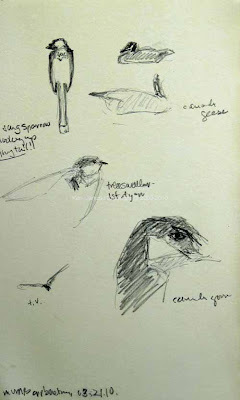 But at PEEC(Pocono Center for Environmental Education) we saw a Golden-Winged warbler. It would be hard to choose between those two witch hazel experiences. 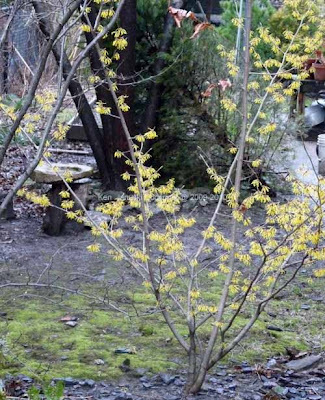 But we'll take any and all of them as our first yard warbler for this witch hazel. 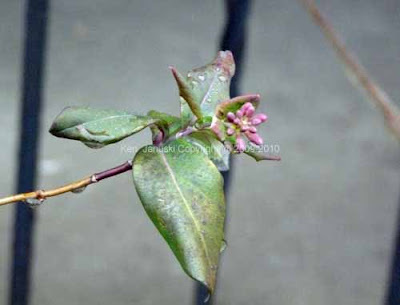 Along with the witch hazel are a spicebush, Trillium Grandiflorum, Blue Cohosh, Black Cohosh, Twinleaf, other trilliums, Goldenseal, Hepatica, and a few other plants so common to areas like Shenandoah. Many of them can also be found in the Wissahickon, just a short half-mile from our house. Slowly we've added them to our small yard. It really seems like spring when they begin so shoot up from the soil, or go into full bloom like the witch hazel. The hellebore above is in the same area. The first flower is just starting to unfurl at center left. These we actually have never seen in the wild but that's probably because we're just not out early enough in the season. Perhaps they're always blooming when I'm stuck inside with taxes. In both of our small front and back yards we grow an American honeysuckle, I believe 'Alabama Crimson'. It was a real surprise to see the flower buds on the one in the front yard. They seem like such a summer flower, especially with their rich crimson color and their hummingbird visitors. But in my experience they also flower early. Still it's a shock to see these buds here already. Our spring flowers are just starting to poke their head out of the ground and yet this summer flower is almost ready to bloom! 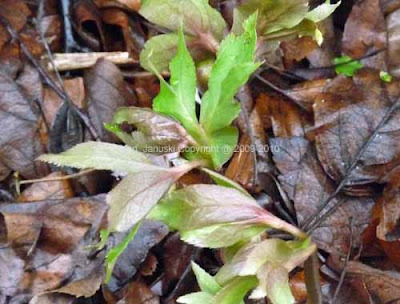 If you're a gardener, as both of us are, of course it is not just flowers that bring excitement to early spring. 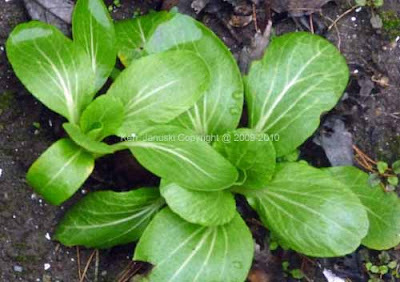 So do vegetable and herbs, in fact any sign that dormancy is done and vigorous vegetal life is here again. Above is a choi that survived our cold frame and the broken glass that's been on top of it along with four feet of snow for the past few weeks. Two of the three cold frame windows broke under the weight of all that snow. And yet our plants survived and look great. This is a choi, I think 'Bonsai' maybe from Johnny's Selected Seeds. It seems a fitting reward for the hours spent today on the computer doing taxes: seeing the first, infectiously optimistic, signs of spring! 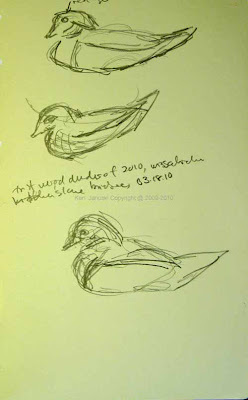 Next on the agenda: art and the first warblers of 2010! It was unmistakably the first day of spring today, perhaps not by the calendar but certainly by the weather. Normally we see our first Kildeer of the year about this time each year at Morris Arboretum in Philadelphia. Sure enough we found two today, mating no less. Actually members of the Icterid family, Blackbirds, Grackles and Cowbirds are earlier migrants. 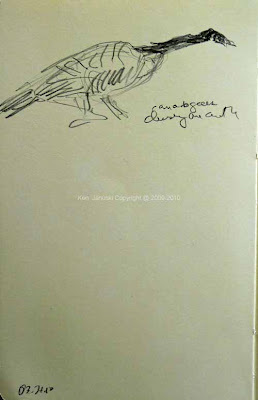 We have gotten both Grackles and Cowbirds in our backyard over the last two weeks. Many wouldn't consider them true, or at least desirable, migrants. Certainly not the cowbird because of nest parasitism. But I really enjoy Grackles. I did one field study this week but he moved too quickly so I really don't have anything to show. 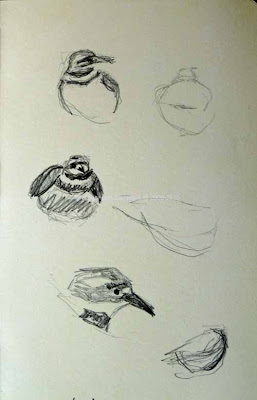 I did do some fieldsketches of the Kildeer today and also a quick watercolor from photos I took. 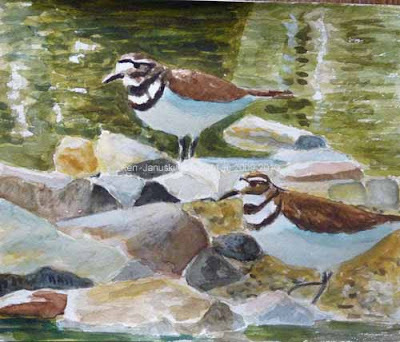 More than anything else I think the watercolor shows how well the Kildeer, and other shorebirds, can camouflage themselves. It was a pleasure to see them. Spring is here! It may be a little too early for Fiddlehead Ferns. But it's never time to fiddle with your artwork. It's always been true for me, and I'd guess for most people, that finishing a painting or drawing is always the hardest part. Rather than face the problems head on, assuming that you can even see what they are, artists of all sorts tend to fiddle. Put a little dab there, a little dab here, oh I messed that up better just erase what I just did, oops now look what I've done I've really messed this up, etc., etc. The other problem is stopping too quickly, never pushing yourself to be a bit more ambitious. In any case all of those thoughts came into play with this pastel. I've spent a fair amount of time on it this morning but fear doing anything more. I think it's improved and has that sense of a bright beautiful bird on a bright beautiful morning, up in the trees, just like he always is. I haven't had any time to do any artwork over the last week. But I did have an interesting week reading the first two books published on artist Robert Bateman. I've never looked at him closely, but what I have seen I haven't liked much. I know that this is probably considered sacrilege in wildlife art circles. But I have to say that I'm glad I read the two books. I have a new appreciation for him. That appreciation had begun with an essay by him on the Wildlife Art Journal (the site is a pay site but some samples are available for free). The essay is called, as I recall, something like 'Why I Am a 21st-century Conservative.' I found myself thoroughly in agreement with him in terms of how neo-conservatives have absolutely corrupted the notion of 'conservation', natural, social and cultural. I was so impressed by it that I wanted to give him another look. It has been a pleasure. For one thing the reproductions are richer than those I'd seen elsewhere. In particular the color is much richer. And the design stands out more. Also Bateman talks about how he's not happy when people praise his skill in portraying detail. That's not really all that important to him. This was a surprise because if I'd had to sum up his work previous to reading these books I would have said: too much detail, rendered in too-muted colors. So it was a pleasant surprise to see that though he does care about detail that is only part of his motivation. I don't want to go on anymore about him here. Perhaps in another post. 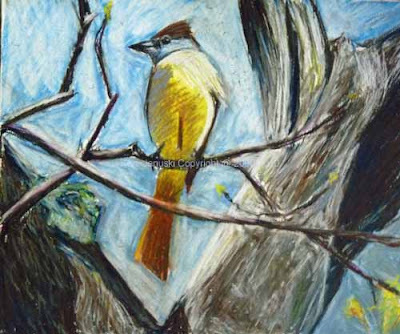 In any case seeing how important design was to him reminded me of my Great-crested Flycatcher still on the back burner, waiting for a more developed rendering than my last quick watercolor. I've had these photos for a couple of years and just couldn't figure out how to do a painting or drawing based on them. Today I did a few more design experiments in color and then finally went with something fairly similar to what I used a couple of weeks ago. It is amazing to me how much time I spent on trying to figure out a design that I liked. This was the only one that showed promise. There is definitely more work to do here. But it's off to a solid start. I suppose I could still ruin it. But since I haven't posted anything in awhile I wanted to post it, half-done though it is.